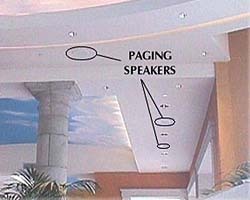 Paging System Foothill Ranch | Overhead Paging System CA | Paging Speakers 92610 - Mark IV Communications, Inc.
Mark IV Communications in Orange County can help your business incorporate a new paging or sound system into your facility. We have performed custom installations for both small- and large-scale applications, in buildings ranging from 5,000 square feet to one million square feet. Our knowledge and expertise in overhead paging equipment and systems includes the installation of background music in offices, schools, warehouses, manufacturing facilities, and retail stores. Mark IV offers a variety of paging and sound equipment for your custom installation. Zone paging allows for one- or two-way paging directed into a number of different paging areas. Zones can be grouped together so that more than one zone can be paged at the same time, and all areas can also be paged at once.